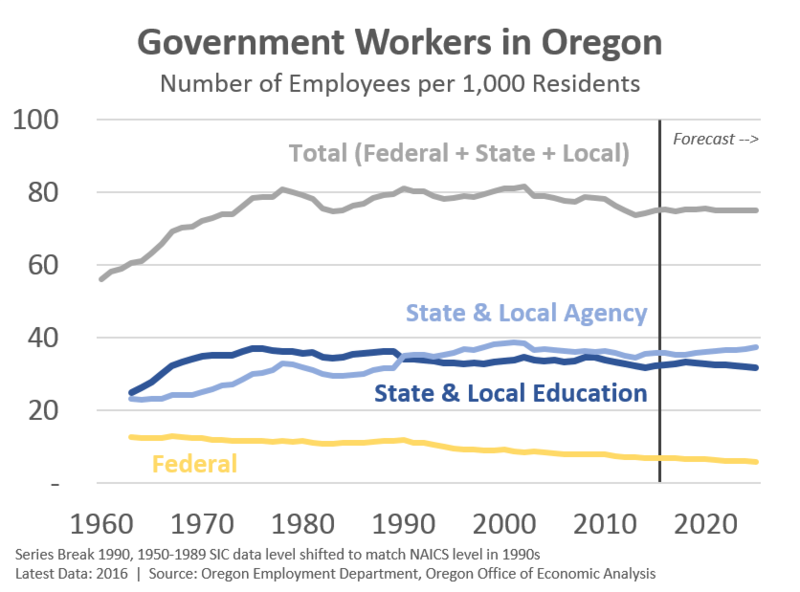 Yes, the public sector here in Oregon continues to grow. We have never had more public employees or more tax revenue than we do today. 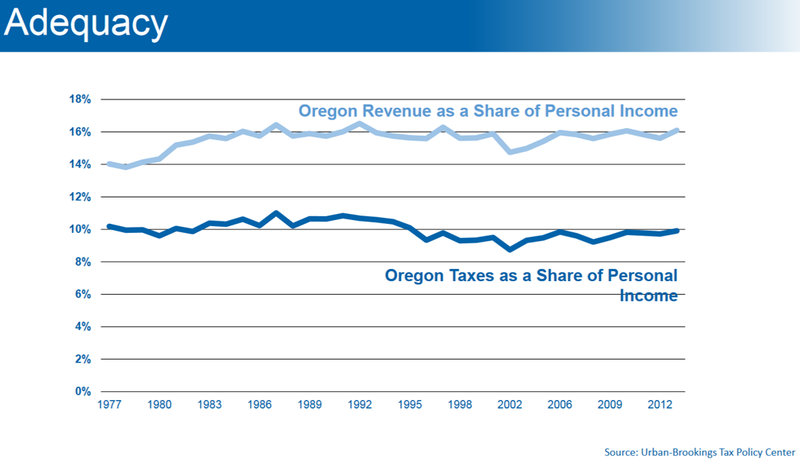 However the regional economy and the number of total Oregonians has never been larger either. 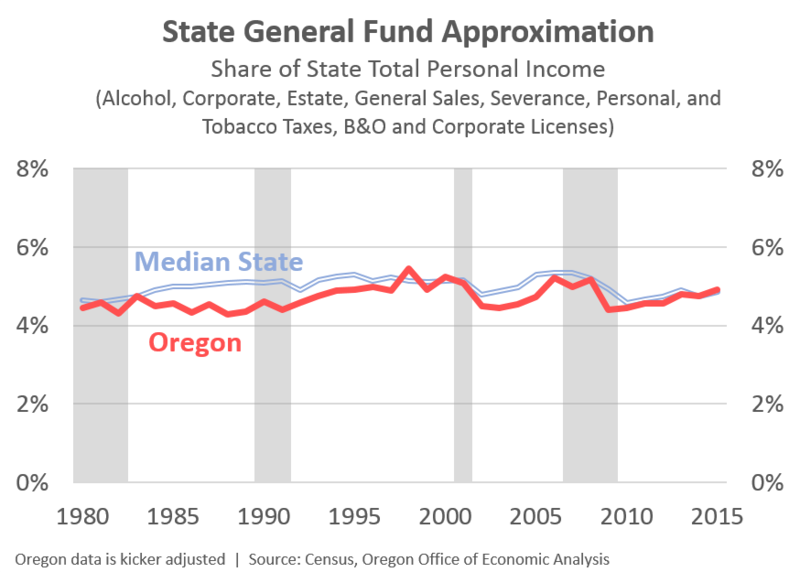 Once you make the adjustment of comparing the public sector to the size of the population, or tax revenues as a share of personal income, Oregon’s public sector hasn’t increased in size for decades. And make no mistake, adjustments like these are the correct way to examine the size of government over time. Reasonable people, and unreasonable ones too I suppose, can debate the proper role and scope of the public sector. However a larger population means there are more residents in need of services, from schools to roads to law enforcement and so forth. And a stronger economy generating jobs and income does translate into more tax dollars for the public sector. The first chart shows public employment relative to the state’s population over time. There was a sizable increase in the 1960s and 1970s as safety net programs were expanded and the Baby Boomers aged through the education system. However since 1980 or so, public employment has been growing in-line with the overall Oregon population. And if we’re really trying to keep score, the relative size of the public workforce today is the smallest it has been since the early 1980s. Public education employment hasn’t been this low, relative to the population, since the 1960s, at least in part because the school-age population is a shrinking share of the state population. Tax revenues are no different. They grow and decline along with the business cycle, but have remained a steady share of personal income for decades. Such findings are seen in many other research reports as well. For example, here is what ECONorthwest President John Tapogna showed as part of the Oregon Business Plan [pg 31] at their early 2017 annual meeting. These figures include a broader set of public revenues than what is included above, but the big picture takeaway is the same. Now, some of you may be asking why we have budget issues when public employment and revenues have been a stable share of the economy. There’s a short answer and a long answer. The short answer is costs are increasing faster than revenues, and forecasted to continue to do so. The long answer is more complicated and the spending, or expenditure, side of the discussion is outside our office’s duties and expertise. That said there are numerous complicating economic and demographic factors influencing these budget issues as well. I gave a presentation on some of these issues earlier this year and will write a summary in the coming weeks. Stay tuned. « Labor Supply, How Much More?